Recipes for those who like to impress, but don't like spending a long time in the kitchen. I’m not much of a home cook anymore, but that doesn’t stop me from clipping recipes. Some of the ones in my file go way back to when Dotty Griffith was a food writer at the Dallas Morning News. She used to run recipes from local restaurants before there was internet or cell phones. I inherited this clipping obsession from my mother. 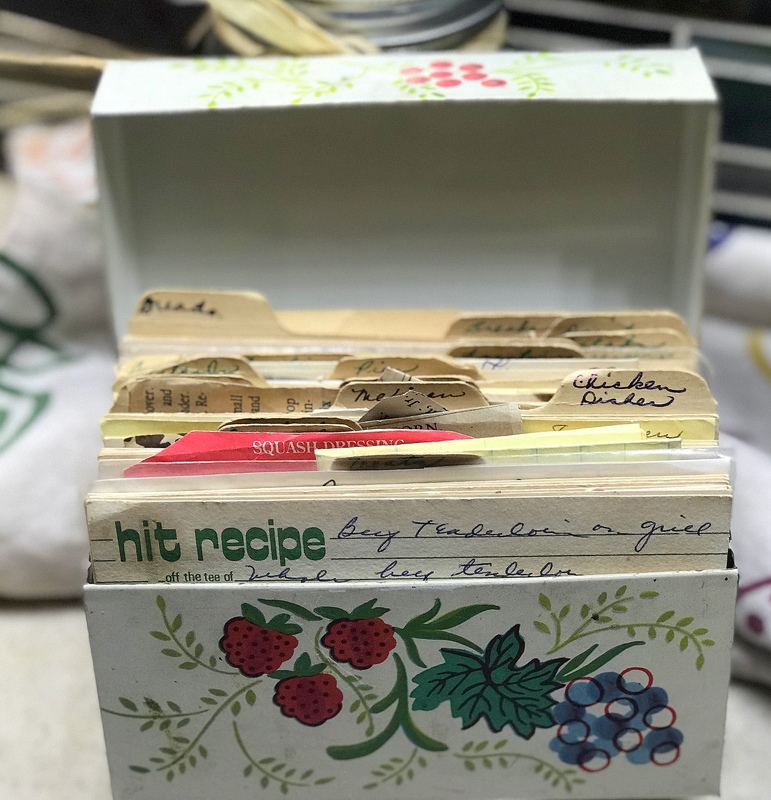 When she passed, I kept her tin recipe card box. It’s full of family recipes and many DMN clips from Julie Bennell, the food editor at the paper for 25 years. She died in 1982. I used to whip up a version of her Pepper Steak Bordelaise when I was trying to impress a suitor. It must have been before men were attracted to tarragon. Holiday food is usually sentimental. Everyone has a favorite dish or dessert they crave when December rolls around. I’d like to share a few I’ve collected fairly recently. Most of them are not holiday specific, but they come in handy for a party or a cold winter’s day. If we ever have one. Cream butter and cream cheese. Slowly add sugar, beating until fluffy. Beat in egg yolk. Add flour and vanilla and mix well. Chill dough for at least one hour. Shape dough into 1-inch balls and place on a greased cookie sheets. Gently press a cherry or pecan into each cookie. Bake at 325 degrees for 12 to 15 minutes. Place the eggs in a large pot of cold, salted water. Turn burner to high heat, bring to a boil, and decrease heat to a simmer. Cook for exactly 9 minutes. Remove from heat and immediately shock the eggs in ice-cold water. Peel the eggs under cold running water. Halve the eggs. Scoop the yolks into a food processor and blend until smooth. Trim a small slice of egg white off the bottom of each white so it will sit still and upright when plated. Add all remaining ingredients, except the red curry paste, to the food processor. Blend until smooth. Do not over-blend or mixture will separate. Transfer mixture to a bowl and fold in red curry paste. The mix should be slightly salty to balance flavor with unseasoned egg white. Spoon the yolk mixture into a pastry bag or a large Ziploc bag and cut opening in corner. Pipe mixture into each white and fill completely. Garnish with parsley, a small dollop of crème fraîche, and a tiny spoon of caviar. Sauté butter and garlic until light in color. Add flour to form a roux. Slowly whisk in the milk and cream, making sure to work out any lumps in the mix. Stir in the cream cheese, Reggiano cheese, lemon juice, chicken marinade, green Tabasco, and salt. Remove from heat. Fold in fresh crabmeat. Pour into baking dish and top with breadcrumbs. Heat under a broiler until golden brown and serve. Blend all wet ingredients in blender. Pour into 8 to 10 mugs. Top with freshly grated nutmeg. Place the apples in the basket of a food mill on top of a 2-quart bowl. Following the manufacturer’s directions, use the medium disk and turn the handle to pass the apple through the disk, leaving the skins in the basket and the applesauce in the bowl below. If mixture looks too thick, add some of the reserved liquid and cool. Mixture will thicken when cold. If necessary, add sugar to taste. Grate the raw potatoes using the large grating disk on a processor or the largest holes on a grater. Place grated potato in a colander, rinse with cold water, and drain. Combine eggs, salt, pepper, and matzo meal in a 3-quart bowl. Mix thoroughly. Change to the cutting blade on your processor. Add onions to the work bowl. Pulse on and off five times. Add ¼ of the grated potatoes to the onion and pulse on and off to make a coarse paste. Add to the egg mixture and stir to combine. Heat a large frying pan or large skillet for 20 seconds. Add enough oil to cover the pan to a depth of ¼ inch and heat for an additional 20 seconds. Drop mounds of potato mixture into the pan. Fry on both sides until golden. Drain fried latkes on a platter covered with crumpled paper towels. Serve with applesauce and sour cream. Use a Dutch oven or a cast-iron skillet. Place the onions, garlic, and oil in skillet. Saut until soft. Add the beef cubes and sear. Once the meat is brown and seared on the outside, add the beef broth and heat for a couple of minutes. Add the remaining ingredients, except the beer and beans. Bring to a boil, then reduce heat and simmer for about 45 minutes, partially covered. After 45 minutes, add the beans first, then pour in the beer while stirring the chili. Cook for 15 minutes. Bake in one large 15-inch cast-iron skillet and one smaller skillet; or divide between two medium skillets. Recipe can also be halved. The corn pudding is made by pureeing fresh, raw kernels from 8-10 ears of corn. Add a touch of salt and cook over a double boiler until puree thickens, about 45 min. For the cheese, use Veldhuizen Aged Redneck Cheddar [from Dublin, TX]. Fontina or Monterey Jack works well too. Heat cast-iron skillets in oven while you put the recipe together. In a bowl, combine melted butter, sugar, and eggs. Add corn pudding, buttermilk, and cheddar and whisk until combined. Stir in jalapenos. In another bowl, sift flour, cornmeal, baking powder and salt together. Fold flour mixture into egg mixture very gently. Do not over-mix. Remove cast iron pans from oven. Grease with oil lightly and pour in the cornbread mixture. Bake until skewer comes out clean, about 40-45 minutes for 15” pan, 30 minutes for the small.